Pressure, flow and piston-type gages are all found within this category. Clean design, small size and low cost with enough accuracy for all but the most demanding applications, these gages are the best around. 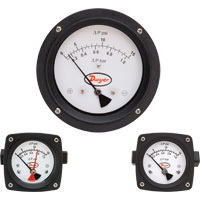 Gages are indicators for the difference between two pressures or simply a single pressure. Magnehelic® Differential Pressure Gages is a versatile low differential pressure gauge with a wide choice of 81 models and 27 options to choose from. Applies to a variety of applications. 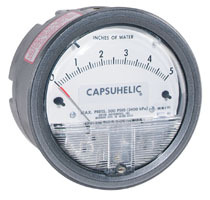 Capsuhelic® Differential Pressure Gage is designed to give fast, accurate indication of differential pressures. Measures flowing fluids, pressure drop across filters, and liquid levels in many applications. 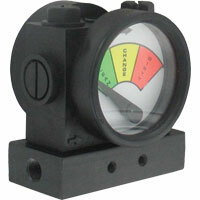 Minihelic® II Differential Pressure Gage combines clean design, small size, and low cost. Latest in design. Easy to read and can safely operate at total pressures up to 30 psig. 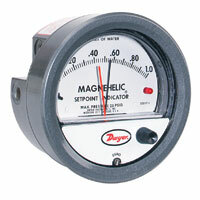 Magnehelic® Differential Pressure Gages has a bright red LED on right of scale that shows when setpoint is reached. Field adjustable from gage face. DigiMag® Digital Differential Pressure and Flow Gages monitors the pressure of air and compatible gases. 4-digit LCD can display readings in common English or metric units. Differential Pressure Piston-Type Gage can be used to measure the pressure drop across filters, strainers, pump performance testing, and heat exchanger pressure drop monitoring. Simple, rugged design. Process Filter Gage is designed to determine the state of an inline filter. Determines the pressure drop on either side of a filter. Suited for filter applications, line loss, valve drop, and other differential pressure applications. ATEX Approved Series 2000 Magnehelic® Differential Pressure Gage can indicate positive, negative or differential pressures. Applications include filter resistance, furnace draft, and liquid levels with bubbler systems.